"Best World-Wide Results in Mitral Valve Repair"
The development of mitral valve repair is one of the success stories in Medicine. In the 1960’s and 70’s, mitral valve replacement was the highest risk of the common adult cardiac procedures, with operative mortalities of 20-30% (2). Based on innovation from many sources (3), reparative methods were refined, and Carpentier’s 1983 lecture created a unified approach (4). 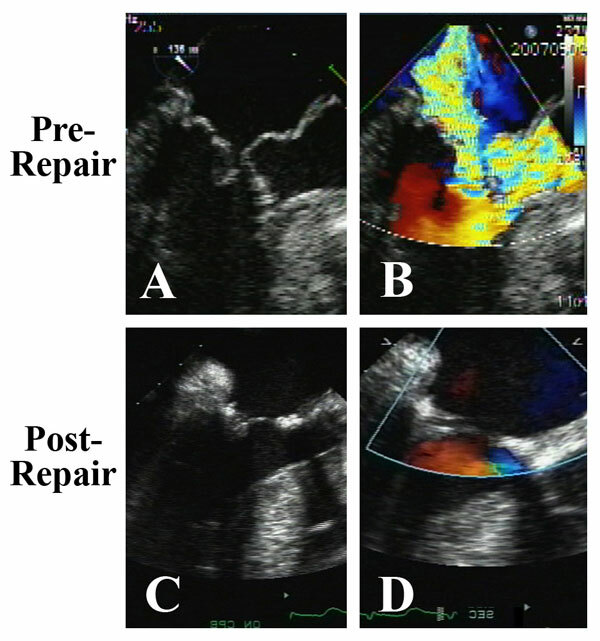 At that time, most centers instituted valve repair programs, and now 25 years later, it is clear that effective restoration of mitral valve function with the patient’s own tissues is associated with significantly better long-term results than with prosthetic valve replacement (Figure 1). Legend: Survival after isolated mitral procedures at Duke University 1986-2006 (n=2064). Panel A: Unadjusted raw survival data for valve repair, mechanical valve replacement, and tissue valve replacement. Panel B: Risk-adjusted survival using a Cox proportional hazards model to account for differences in baseline characteristics between groups and also in propensity to choose various procedures. Mitral valve repair achieved the best outcomes and tissue valve replacement the worst. This principle seems to hold for all mitral disease etiologies, for all age groups, and for both mechanical and tissue valves (5-8). The clinical goal now might be to expand repair techniques into larger populations of mitral disease patients. In this regard, recent approaches using artificial chordal replacement (ACR), autologous pericardial patches, and full ring annuloplasty have been highly successful in enhancing the applicability and stability of mitral repair. The goal of this paper is to illustrate these techniques across the spectrum of mitral disease etiologies. Abnormalities of chordal support constitute the most common form of mitral disease and account for half of mitral valve surgery. The use of polytetrafluoroethylene (ePTFE) suture for ACR in this setting was described by Vetter and Frater in 1986 (9,10). Importantly, this innovation did not arise de novo, but was based on decades of careful work with chordal replacement using multiple tissues (11,12). Our group tried ACR early-on, but had difficulty getting chordal lengths right, until 1995, when we learned to adjust neo-chordal length with a slip knot at the end of the procedure, after annuloplasty ring placement (13,14). As shown in Figure 2, a pledgetted anchor suture is placed in the posterior papillary muscle, oriented longitudinally, and a 2-0 Gore-Tex suture is passed through the pledget and left untied. Legend: Sequential steps in “adjustable artificial chordal replacement. A: A ruptured chord from the posterior papillary muscle to the posterior leaflet is evident. B: A pledgetted anchor suture is placed longitudinally in the papillary muscle, and a 2-0 Gore-Tex artificial chord is passed through the anchor pledget and left untied. C: After Carpentier ring placement (AnnuloFlow, Sorin Group), the chord is retrieved and woven as a loop into the leaflet in 3 full-thickness bites: free edge, flaring laterally through the surface of coaptation, and then angling back medially through the line of coaptation, emerging onto the atrial surface of the leaflet. D: The chordal slip knot is adjusted during valve testing to produce good anterior-posterior and left to right leaflet symmetry, and no residual leak. The knot is then tied tightly and completed. Heavier 2-0 Gore-Tex suture is used because of several previous cases of late chordal rupture with 4-0 suture (15, 16). 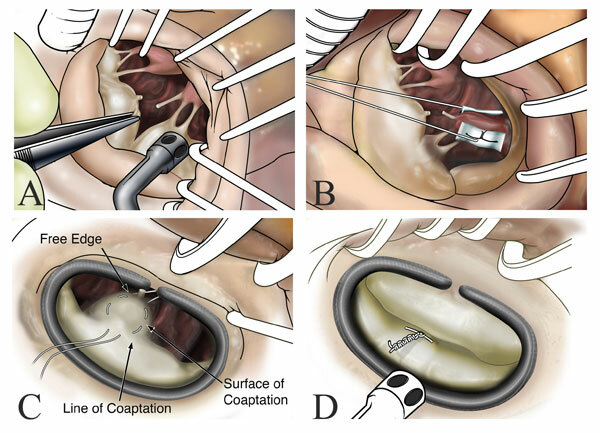 The Gore-Tex chord is stuffed into the ventricle, and after ring placement, it is retrieved and woven into the prolapsing segment in 3 full-thickness bites: free-edge, surface of coaptation, and line of coaptation, emerging onto the atrial surface. This forms a suture loop that stabilizes the lateral aspects of the segment, with the 2 arms of the Gore-Tex suture (passing freely through the papillary muscle pledget) automatically assuming proper length. The Gore-Tex is tied with a slip knot, and an atraumatic clip with longitudinal serrations (Horizon Medium Titanium Clip, #002204, Teleflex Medical Inc.) is placed lightly on the knot. The valve is tested by instillation of cold saline into the left ventricle across the valve, and if the chord to the leaflet is a little tight or loose, the clip is removed by simply pulling it off the Gore-Tex, and the slip knot is lengthened or tightened using atraumatic forceps. This process is continued until, on re-testing, normal anterior-posterior and left-to-right symmetry is established. Then the final knot is tied tightly against the clip. These knots can come untied, so tying against the clip is important. The clip is removed, the suture is cut, and the goal is for the valve to have a large coaptation area and no residual leak. If leak continues, leaflet clefts are closed, or the procedure is repeated as necessary to obtain full competence. One advantage of ACR, however, is that the steps usually proceed in an organized and timely fashion, without the need to “innovate on the spot”. The use of lightly tanned autologous pericardium as a valve leaflet substitute was first described by Love (17), and subsequent clinical application to mitral leaflet augmentation has proven very successful (18-20). Perhaps for immunologic reasons, autologous pericardium does not calcify and remains flexible long-term as an advantaged leaflet substitute (21). The pericardium is harvested at the beginning of the procedure and placed in 0.6% gluteraldehyde for 10 minutes. Gluteraldehyde can harbor bacteria, so it is important for the Pharmacy Department to filter it before surgical use. This fact may account for the high endocarditis rates experienced in early series (21). Legend: Autologous pericardium has been lightly tanned by a 10-minute immersion in 0.6% gluteraldehyde, cut to size, and sutured to the annular aspect of an incision in the posterior mitral leaflet. The top part of the patch will then be sutured to the leaflet side of the incision, completing pericardial patch augmentation of the posterior leaflet. This is useful with rheumatic scarred retracted leaflets, but also with ischemic leaflet tethering or inadequate leaflet tissue associated with pure annular dilatation. Annular dilatation accompanies most mitral valve disease, and annuloplasty probably should be performed in all forms of mitral valve repair to minimize late recurrence. Carpentier’s original annuloplasty ring design involves a 7:10 elliptical D-shaped design, which both reduces annular circumference and restores annular shape to its normal elliptical configuration. Although a plethora of alternative rings have been introduced, including partial and flexible varieties, none have been shown to perform better than the original Carpentier design. In fact, restoring fixed end-systolic annular size and ellipticality probably have important applications. Reducing anterior-posterior dimension has been shown to be especially efficacious in ischemic mitral regurgitation (27,28), and may reduce late recurrence rates for all etiologies by increasing leaflet coaptation area. Early on, we experienced the rare failure of repair due to ring dehiscence, and started inserting the Carpentier ring with horizontal mattress sutures buttressed with supra-annular pledgets. Using this method, no more ring dehiscence has occurred in 25 years, and pledgetted insertion is now routine: http://www.jsrmd.com/ftp/1_ACR_ACS.m4v . The following sections address application of these techniques to the repair of specific mitral disorders. Patients with pure annular dilatation, by definition, have no chordal abnormalities or wall motion defects, and do not require chordal procedures (29). They are comprised primarily of patients with medical disorders, such as hypertension, that cause dilatation of the mitral annulus, although many have significant leaflet clefts or small valves, predisposing them to developing valve leakage with annular enlargement. Occasionally, leaflet clefts or other forms of inadequate leaflet tissue require pericardial patching. This group accounts for only 13% of patients undergoing mitral repair. Pure annular dilatation patients are predominantly female, have significant comorbidities, and frequently exhibit ventricular dysfunction. Although raw survival is lower because of the higher incidence of comorbidities, risk-adjusted prognosis after mitral repair is similar to patients with myxomatous prolapse (29). Even in patients with poor baseline risk profiles, aggressive full ring mitral annuloplasty is indicated with negligible late failure rates. ACR also is well-suited to minimally invasive approaches, and in our center, robotic ACR is used primarily for repair of patients with simple prolapse, usually clearly defined isolated posterior leaflet defects (30). Robotic cases are selected carefully, but even then, evidence may be emerging that risk-adjusted mortality and complications could be higher with minimally invasive procedures, because of lack of adequate exposure and control of all aspects of the procedure (31). At any rate, more complicated repairs are still performed through median sternotomy incisions in our practice, the first priority being to achieve an excellent, long-lasting repair - in the largest percentage of patients possible - at the first operation. 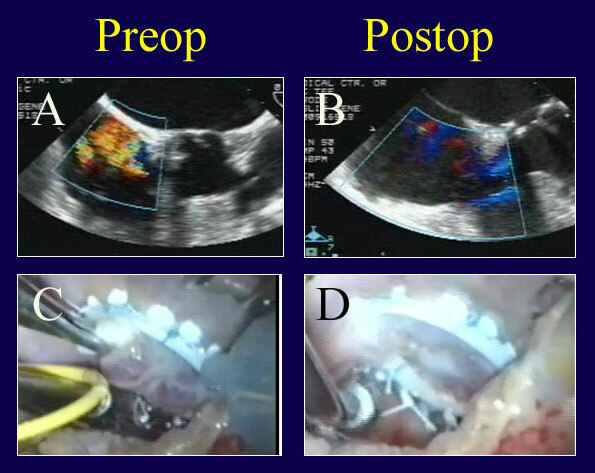 In Figure 4, a valve from a patient with posterior chordal rupture is illustrated before and after robotic ACR. Legend: Robotic ACR of a valve with multiple posterior leaflet chordal ruptures. A and C: The flail posterior leaflet is evident. B: After placement of a single ACR from the posterior papillary muscle to the posterior leaflet, the valve is completely competent. D: After ACR, the prolapsing posterior leaflet is well below the annular plane, with a good surface area of coaptation, and complete recovery of competence. Chordal length adjustment was performed after placement of the full annuloplasty ring (Memo 3D, Sorin group). The defect was repaired with a single chord to the posterior papillary muscle and ring annuloplasty. A video of this procedure is at: http://www.jsrmd.com/ftp/8_RACR.mov . Although techniques for minimally invasive mitral repair are widely applied at present, it still remains to be shown that long-term results are as good as with current open methods, especially in broader mitral disease categories. It is unusual to encounter true commissural prolapse, but in Figure 5, a patient with severe MR was shown on echo to have components both of posterior and anterior leaflet prolapse toward the right commissure. Legend: Echo and video findings in a patient with true commissural prolapse, before and after ACR repair. A: Severe MR is evident, and components of anterior, commissural, and posterior leaflet prolapse were visualized. B: After ACR repair, the valve is completely competent with good leaflet position. C: A “windsock” of true commissural prolapse is present. D: Valve symmetry and competence are normal after ACR placement to both leaflets and full ring annuloplasty (AnnuloFlow, Sorin Group). Those findings can indicate true commissural prolapse. On valve testing, the posterior commissure was almost a windsock, with both leaflets involved. 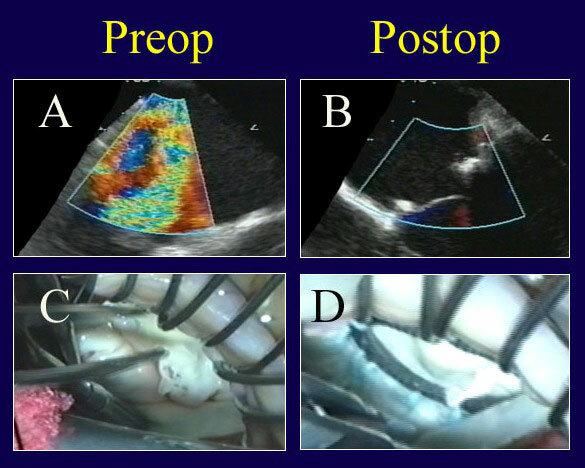 Artificial chords were placed to both leaflets, with a good anatomic result and no residual MR (Figure 5), illustrating the utility of ACR for repairing less common forms of mitral prolapse. In generalized bi-leaflet prolapse, or Barlow's valves (Figure 6), 2 chords are placed to each leaflet (16). Legend: ACR repair of a Barlow’s valve with multi-segmentation, generalized prolapse, and annular calcification. A: The repair is begun by limited decalcification of the annulus (enough to allow forward annular positioning with ring placement). Multiple prolapsing segments are evident. B: After ring annuloplasty (AnnuloFlow, Sorin Group) and placement of 4 sets of artificial chords (with length adjustment of 2), the valve is fully competent. C: Typical generalized prolapse associated with a Barlow’s valve is evident on echo, also with a severe central jet of regurgitation. D: After ACR repair, leaflet position is excellent with a good surface area of coaptation and no residual leak. Leaflet is never resected, and the authors believe that the concept of “excess leaflet tissue” is not applicable to this situation – the more leaflet surface area, the better the competence. The left chords are anchored to the anterior papillary muscle, and the right to the posterior papillary muscle. The echo shows a typical Barlow's valve with generalized prolapse and a severe central jet. Many Barlow's valves have annular calcification, which is first de-calcified. Then multiple segmentations are evident, all of which are prolapsing. After placement of 4 sets of chords, two are short, and they are independently lengthened. At the end, the valve is nicely symmetrical, with good coaptation area and no residual leak. A video on Barlow’s repair is at: http://www.jsrmd.com/ftp/34_BACR.m4v . Patients with mitral endocarditis represent a difficult group for the cardiac surgeon, and more innovation and development of surgical concepts will be required before management of endocarditis is optimized (32). One candidate for outcome improvement is increasing valve repair rates, since valve repair for endocarditis is associated with a one third reduction in risk-adjusted mortality in the STS database. Obviously, ACR can play a major role in endocarditis repair with disrupted chordal attachments, and together with pericardial leaflet replacement, most endocarditis valves can be repaired (33,34). The timing of intervention is controversial, but the authors suggest that efforts should be expended to convert each patient from “active” culture positive to “treated” status before undertaking surgery. In the STS database, “treated” status is associated with improved results (32), and in recent practice, it is interesting how many patients can be treated with prolonged antibiotics and converted to culture negative before performing valve repair. In Figure 7, a patient is illustrated with multiple holes in the posterior leaflet and disrupted chordae to both leaflets. Legend: ACR repair of a patient with fully treated endocarditis. A: The echo exhibits severe valve leak. B: After repair with suture closure of multiple posterior leaflet holes and ACR to both leaflets, the valve is fully competent. C: The multiple holes in the posterior leaflet are evident; these are sutured closed and ACR’s are being performed after ring placement (AnnuloFlow, Sorin Group). D: With valve testing after ACR repair, the symmetry of the competent valve appears normal. The patient was first converted to culture negative, and after suture closure of the leaflet defects and ACR to both leaflets, the valve is entirely competent. As stated above, larger leaflet defects can be managed with patch augmentation using gluteraldehyde-fixed autologous pericardium (19,20). Videos from several cases are at: http://www.jsrmd.com/ftp/5_UACR.m4v . The patient in Figure 8 had a failed repair at another hospital 11 months earlier. He continued to deteriorate symptomatically, and on echo, severe MR was evident from 2 separate jets. An inadequate posterior leaflet was encountered from over-resection, and also a hole adjacent to an anterior annular suture. An Alfieri stitch was taken down, and the previous ring removed. At that point, a prolapsing posterior commissural cusp was evident that was missed at the first operation. A Gore-Tex suture was placed into the posterior papillary muscle and stuffed into the ventricle. The anterior leaflet hole was sutured, the posterior leaflet was disconnected from the annulus, and a lightly tanned autologous pericardial patch was inserted to restore posterior leaflet surface area. A Carpentier ring (AnnuloFlow, Sorin Group) was true-sized to a smaller ring than chosen before. The artificial chord was placed to the commissural cusp and was short on testing. Therefore, the slip knot was lengthened, and then the valve was fully competent, with good coaptation, and no residual leak (Figure 8). Legend: Re-repair of a prolapse valve after failed reconstruction. A: Two jets of regurgitation are evident – one from a leak through a suture hole in the anterior aspect of the ring sutures, and a second from an inadequate posterior leaflet after over-resection. The leaflet hole is closed, an Alfieri stitch is taken down, a posterior leaflet autologous pericardial patch is placed to compensate for insufficient posterior leaflet surface area (C), and a Gore-Tex ACR is placed to a prolapsing commissural cusp (that was overlooked at the first procedure). After ring placement (true-sized to a smaller diameter; AnnuloFlow, Sorin Group), the chord is adjusted once, and the valve is fully competent (B). 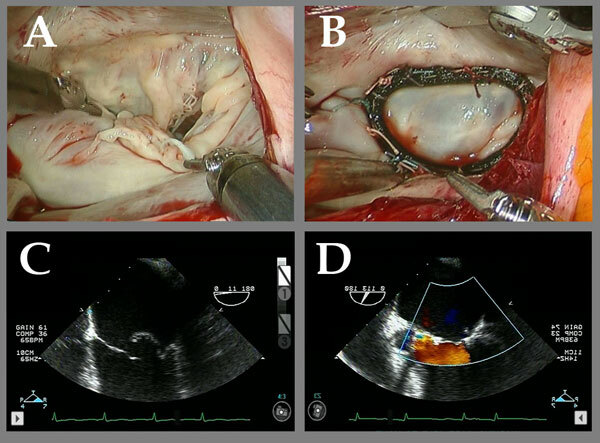 The tied ACR and the good leaflet symmetry are shown in panel D.
Legend: A patient with long-standing rheumatic mitral stenosis and regurgitation undergoing a rheumatic repair. 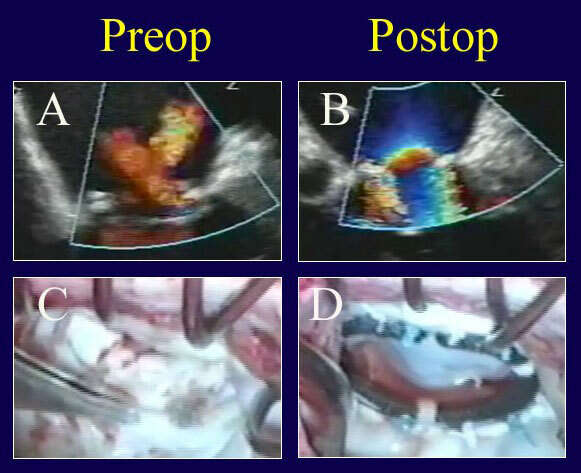 A and B: On pre-bypass echo, the stenotic and insufficient mitral valve is demonstrated. C and D: After insertion of an autologous pericardial patch into the posterior leaflet, decalcifying commissurotomy, resection of the submitral apparatus to the anterior leaflet, and re-attachment of the mobile anterior leaflet to both papillary muscles with adjustable ACR, the valve is fully competent with insignificant gradient. A full rigid ring also is placed (AnnuloFlow, Sorin Group). These types of more comprehensive ACR repairs for rheumatic valves have been quite stable in the intermediate-term. Hypertrophic obstructive cardiomyopathy is often accompanied by severe mitral anomalies, including papillary muscle prolapse into the outflow tract and severe MR. Recently, a repair approach has been devised for this difficult anomaly, including standard septal myectomy, resection of the obstructing anterior papillary muscle, and reconstruction of the left half of both mitral valve leaflets with artificial chords (37,38). The patient illustrated in Figure 10 is recovering from HOCM crisis with pulmonary edema, severe MR, and apical LV dysfunction. 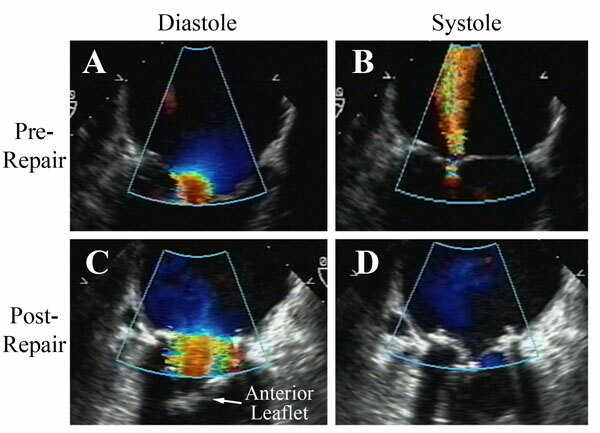 On echo, severe systolic anterior motion of the anterior mitral leaflet is evident, and one can see the papillary muscle prolapsing into the outflow tract and butting against the hypertrophied septum. Legend: ACR mitral repair in a patient with HOCM crisis and severe mitral anomalies. 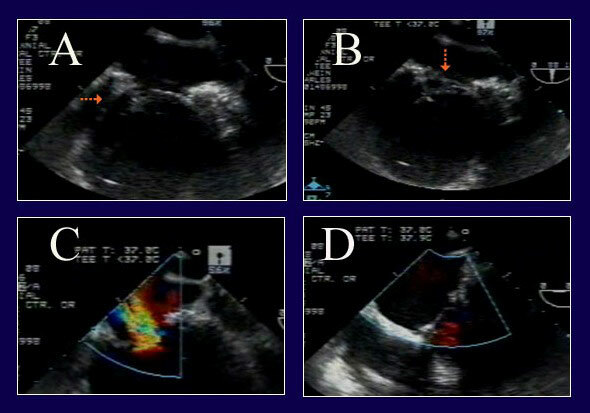 A and B: Pronounced systolic anterior motion of the anterior mitral leaflet and anterior papillary muscle prolapse against an asymmetrically hypertrophied septum produces severe outflow tract obstruction and mitral regurgitation. C and D: After septal myectomy, resection of the obstructing anomalous anterior papillary muscle, and mitral reconstruction with ACR and ring annuloplasty (AnnuloFlow, Sorin Group), the outflow obstruction is relieved, the systolic anterior motion is eliminated, and the valve is fully competent. This type of repair has been quite stable in the intermediate-term. This abnormal contact between the anterior papillary muscle and the septum may increase stress in both and be the factor accounting for localized hypertrophy of both structures in HOCM. The MR can be severe, and on 3-D echo, the anterior papillary muscle tip is visualized prolapsing into the outflow tract on multiple views. Through an oblique aortotomy, the anterior papillary muscle is identified in the outflow tract. The offending anterior papillary muscle head is disconnected from the mitral valve and then is resected. A Morrow-style myectomy is performed to the left of the ventricular septum, and the aortotomy is closed. The left atrium is opened, and the remaining anterior papillary muscle is resected completely to prevent subsequent obstruction lower in the ventricle. The left aspects of both mitral leaflets then are disconnected from chordal support and flail. Three artificial chords are placed into multiple posterior papillary muscle heads, and after ring placement, they are retrieved and woven into the anterior leaflet, commissure, and posterior leaflet. On testing, fine adjustments of chordal length are accomplished, and at the end, the valve is completely competent, with good coaptation, and no residual leak (Figure 10). Outflow gradients with this technique have reduced to physiologic levels, and have remained stable long-term; however, it is important to completely resect the entire anterior papillary muscle all the way into the apical ventricle. It has been important to attach the chords to multiple posterior papillary muscle heads, since funneling all of the chords to one point might obstruct mitral outflow. Videos of 3 cases are at: http://www.jsrmd.com/ftp/40_HOCM.m4v . Ischemic MR (IMR) usually is managed with rigid ring annuloplasty alone (39,40), but as in George Burch's original drawings (41), IMR can be complicated by leaflet tethering due to infarct expansion, or prolapse from papillary elongation. These complex anatomies are more common in chronic IMR patients and can require additional repair techniques beyond ring annuloplasty to avoid late MR recurrence. The patient in Figure 11 has severe MR associated with posterior leaflet tethering, but also had anterior leaflet prolapse due to elongation of a papillary muscle head. He had a previous coronary bypass surgery, and his ventricle was severely dysfunctional. Legend: ACR repair of complex IMR in a re-operative patient with severe LV dysfunction. A: The posterior leaflet does not close properly due to tethering (arrow) from posterior wall infarct expansion. B: However, on a different view, a segment of anterior leaflet also is prolapsing (arrow) due to papillary muscle elongation. C: The severe MR from both leaflet abnormalities is evident. D: After pericardial patch augmentation of the posterior leaflet and ACR to the anterior leaflet, the valve is fully competent. Full ring annuloplasty also was performed (AnnuloFlow, Sorin Group). This exceptional anatomy illustrates 2 of the more complicated problems that can be encountered in IMR, tethering and prolapse. In this case, Langer's posterior leaflet pericardial patch (42) was performed to compensate for the posterior leaflet tethering, and the anterior prolapse was corrected with a single chord to an anterior papillary muscle, producing full competence (Figure 11). It is important to place artificial chords in IMR to viable papillary muscles to avoid the consequences of late infarct expansion and leaflet tethering. 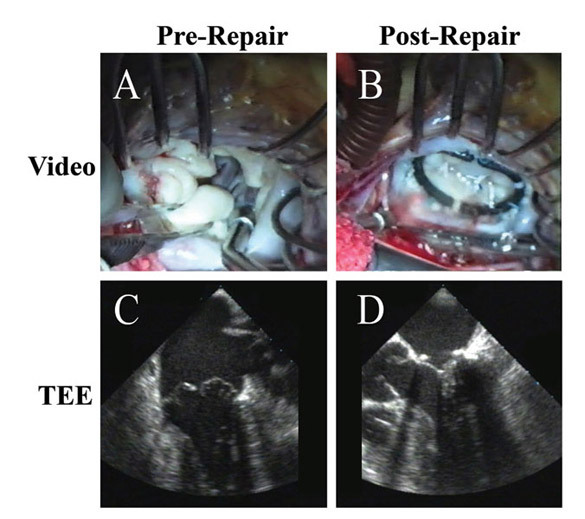 It is a tricky issue to adjust both leaflets just right, but a precise repair usually can be achieved with excellent valve competence long-term, even in the most complex cases: http://www.jsrmd.com/ftp/33_CIMR.m4v . Finally, ACR techniques are equally applicable to the tricuspid valve. The patient in Figure 12 is undergoing a multiple valve procedure, and the associated tricuspid regurgitation is thought to be functional. Legend: A patient undergoing mitral and tricuspid valve repair is thought to have severe TR for functional reasons (A). However, after Carpentier tricuspid ring annuloplasty (Edwards Lifesciences), a prominent prolapse of the anterior tricuspid leaflet and persistent valve leak are noted (C). ACR is performed from an RV papillary muscle to the anterior leaflet (D) with complete recovery of competence (B). After placement of a Carpentier tricuspid ring, however, the anterior tricuspid leaflet is found to be severely prolapsing. While this is not common, tricuspid prolapse can accompany myxomatous disease of the mitral valve. A single chord is placed from a right ventricular papillary muscle to the anterior tricuspid leaflet (and length adjustment performed as for the mitral valve), which corrected the defect nicely. Pericardial patches also are used for tricuspid repair, especially in cases of endocarditis. 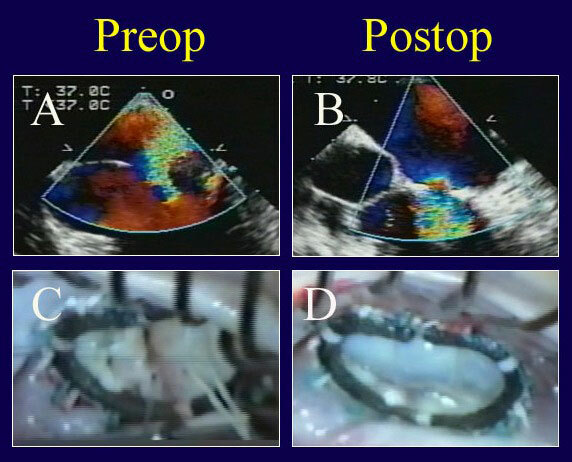 Several cases of complex tricuspid repair are shown at: http://www.jsrmd.com/ftp/9_TVR_VSD.m4v . Legend: Mitral repair rates and operative mortalities for all mitral procedures (including multiple valves) in the author’s practice (27). The recent increase in repair rates toward 100% has been due to perfection of ACR techniques, together with aggressive use of pericardial patches and full rings. With increasing repair (and certainly for other reasons) operative mortality now is near-zero. These data support the increasing use of valve repair across the spectrum of mitral pathologies. http://www.jsrmd.com/ftp/18_Trends_in_MVR.m4v . The combination of ACR, autologous pericardial leaflet augmentation, and full ring annuloplasty allows repair of virtually all mitral and tricuspid pathologies. In over 2000 patients having mitral surgery over the past 20 years (7), risk adjusted survival across all pathologies was best with mitral repair for all ages at implant (Figure 14). Interestingly, patients receiving mitral bioprostheses have worse risk adjusted outcomes than either mechanical valves or repair, and at no age do tissue valves equal the other 2 options: http://www.jsrmd.com/ftp/28_MVR_Age.avi . These and other data support the recent trend toward increasing mitral repair for all ages and for all etiologies of mitral valve disease. Moreover, information is available now from multiple sources that ACR may be associated with lower failure rates and better late outcomes than other techniques (46-53), so the clinical advantages of mitral valve repair are likely to increase further as ACR is adopted more widely. 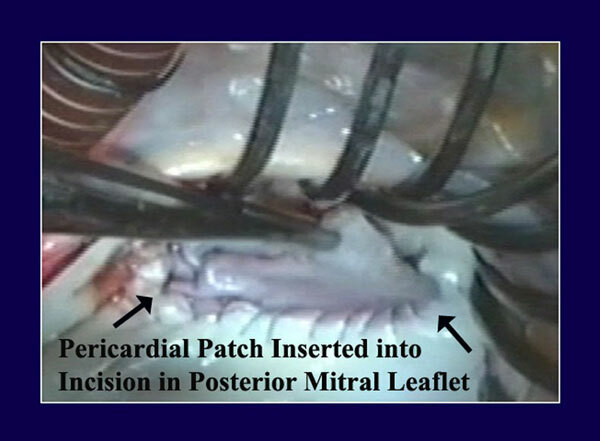 In conclusion, combinations of Gore-Tex artificial chordal replacement, autologous pericardial patches, and full ring annuloplasty (without leaflet resection) allow a greater percentage of mitral and tricuspid pathologies to be repaired. At present, close to 100% of all patients with mitral and tricuspid valve disease can benefit from repair, with stable long-term outcomes. Artificial chords seem to increase stability of repair and reduce late failure rates, and long-term patient outcomes may be correspondingly improved. Thus, non-resectional methods of mitral valve repair are now a key technique in the armamentarium of the adult cardiac surgeon. Milano CA, Danishmand MA, Rankin JS, et al. Survival prognosis and surgical management of ischemic mitral regurgitation. Ann Thorac Surg 2008;86:735-744. Daneshmand MA, Milano CA, Rankin JS, et al. Influence of patient age on procedural selection in mitral valve surgery. Ann Thorac Surg, in-press. Gaca JG, Daneshmand MA, Rankin JS, et al. Re-examination of mitral valve repair in rheumatic heart disease. Accepted for Southern Thoracic Surgical Association meeting, 2010, and submitted to Ann Thorac Surg. Vetter HO, Burack JH, Factor SM, et al. Replacement of chordae tendineae of the mitral valve using the new expanded PTFE suture in sheep. In: Bodnar E, Yacoub M, eds. Biologic bioprosthetic valves. New York: Yorke Medical Books, 1986:772-784. Frater RWM, Vetter HO, Zussa C, et al. Chordal replacement in mitral valve repair. Circulation 1990;82 (suppl IV):125-130. Zegdi R, Khabbaz Z, Chauvaud S, et al. Posterior leaflet extension with an autologous pericardial patch in rheumatic mitral insufficiency. Ann Thorac Surg 2007;84:1043-4. Tibayan FA, Rodriguez F, Langer F, et al. Annular remodeling in chronic ischemic mitral regurgitation: ring selection implications. Ann Thorac Surg. 2003;76:1549-55. Daimon M, Fukuda S, Adams DH, et al. Mitral valve repair with Carpentier-McCarthy-Adams IMR ETlogix annuloplasty ring for ischemic mitral regurgitation: early echocardiographic results from a multi-center study. Circulation 2006;114(suppl):I-588-93. A simplified risk scoring system and need for clinical innovation. Presented at the WTSA meeting 2010 and submitted to J Thorac Cardiovasc Surg. Chiappini B, Sanchez A, Noirhomme P, et al. Replacement of chordae tendineae with polytetrafluoroethylene (PTFE) sutures in mitral valve repair: Early and long-term results.